Well, I got her done! What do you think? I really like this pattern. I made this using the Studio 180 Design Square/Squared and the Tucker Trimmer I. The center of the quilt is not difficult at all. Either are the migrating geese, but you must use your best skills and a true 1/4″ seam. I will be adding this to my class list. 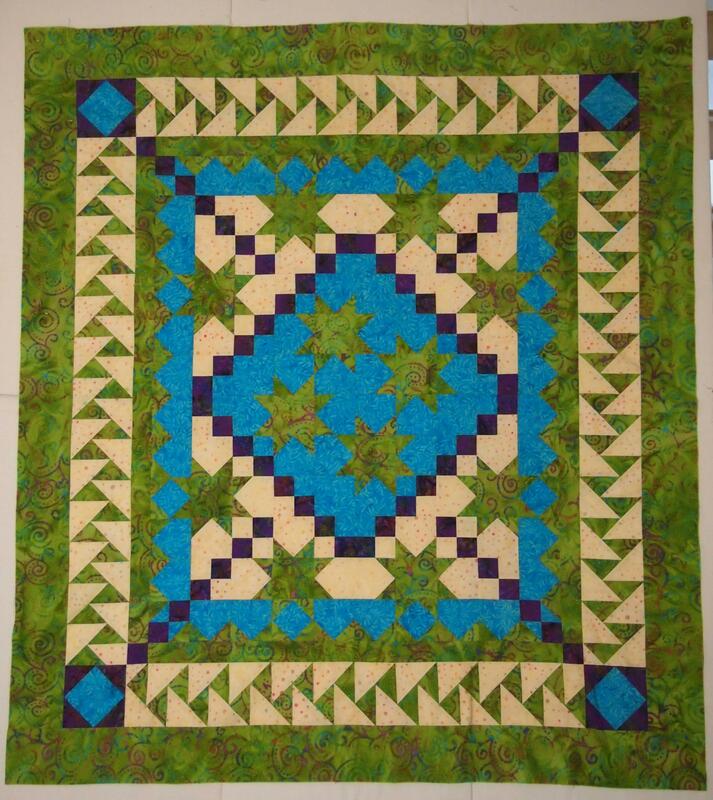 This entry was posted in Square/Squared Tool and tagged quilting, Quilts, Square/Squared, Studio 180 Desing. Deb Tucker, Tucker Trimmer I on October 15, 2013 by ifthesethreadscouldtalk. i am machine quilting the southern hospitality quilt and need some suggestions for the migrating geese. I quilted a feather design in the background triangles and am not sure what to do with the others. Can I leave them alone? Oh Kelley, I wish I could give good advice, but I’m afraid I meander my quilts. Sorry I’m lame about quilting advice. I always admire Angela Walters and Jamie Wallen for their quilting expertise. Absolutely GORGEOUS – like YOU! It’s not just the time you save it is quality of your pieces that will be better by using a rotary cutter, not to mention the fabric you save by using a rotary cutter. What I love about Deb Tucker products is how well organized the instructions are. Usually. When I teach a class I have to remake the lesson plan. But I don’t have to do that with Studio 180 Designs. They even give you both right and left handed instructions. I have been quilting for 10 years so I do have some skills. I made this top in about 10 days. I screwed up when I was cutting out the migrating geese and to go buy more fabric. I cut the pieces too large and when making pieced borders you must be precise. I hope I answered your questions. Let me know if there is anything I can do for you!